i. 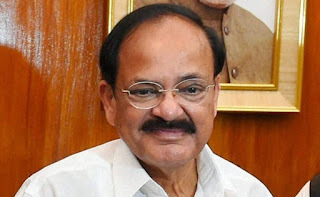 Vice President M. Venkaiah Naidu inaugurated the two-day Civil Services Day event in New Delhi. The Day focuses on the topic ‘Evolving Strategies for Transforming Aspirational Districts’. ii. The Vice President also released a book 'Emulating Excellence- Takeaways for Replication'. The day is celebrated for the civil servants to rededicate themselves to the cause of citizen and renew their commitments to public service and excellence in work. · This was the 12th edition of Civil Services Day. i. Minister of State for Parliamentary Affairs Vijay Goel inaugurated the new office of Central Project Monitoring Unit for the e-Vidhan project of the Government at the Parliament House Annexe. ii. e-Vidhan is a part of the broader Digital India Programme of the Government and is likely to contribute to the cleanliness and environment by reducing the use of papers to a great extent. · e-Vidhan is a mission mode project to digitize and make the functioning of State Legislatures in the country paperless. i. The Union Cabinet approved the promulgation of the Fugitive Economic Offenders Ordinance 2018, which would empower the government to seize the domestic assets of those deemed by a relevant court to be fugitive economic offenders. ii. The Ordinance has a provision for a ‘Special Court’ under the Prevention of Money-laundering Act, 2002 to declare a person as a Fugitive Economic Offender. · An ordinance is an executive order issued by the President of India — on the recommendation of the Union Cabinet — that holds the same force as an Act passed by Parliament. i. With an aim to strengthen trade ties with India, Taipei World Trade Centre (TWTC) launched its office in Delhi, ahead of Taiwan’s first ever expo that will showcase cutting-edge technology and smart city solutions in Delhi in May 2018.
ii. Presence of TWTC in Delhi will further help strengthen business ties with India. Bilateral trade between India and Taiwan has increased to $6.3 billion in December 2017. · James C.F Huang is the chairman TWTC. i. The Ministry of Human Resource Development (HRD) has launched integration of e-SANAD portal and NAD – National Academic Depository in a bid to make education system in India more transparent. ii. e-Sanad is a project aimed at online submission and verification of documents with the ultimate object to extend contactless, cashless, faceless and paperless document attestation service. NAD is a 24X7 online storehouse of all academic awards viz. diplomas certificates, degrees, mark-sheets etc. i. SJVN Limited has signed an MoU with Ministry of Power for the year 2018-19. The MoU was signed by Ajay Kumar Bhalla, Secretary (Power) and Shri Nand Lal Sharma, Chairman & Managing Director, SJVN. ii. As per the targets set in the MOU, SJVN shall strive to achieve 9200 Million Units generation during the year under ‘Excellent’ category. Further, SJVN will have Capital Expenditure (CAPEX) target of Rs. 900 crore and Turnover target of Rs. 2175 crore under the Excellent category. i. Prime Minister of India Narendra Modi was on the three-nation visit of Europe to Sweden, the UK and Germany. ii. He has signed various important agreements and attended various conferences during the visit. Following are the important highlights regarding the 3-nation visit of PM Modi. i. Prime Minister Narendra Modi held bilateral talks with German Chancellor Angela Merkel and discussed ways to further strengthen the strategic partnership between the two countries. ii. It was third and the last leg of Modi’s three-nation tour to the UK, Sweden and Germany. · Germany Capital- Berlin, Currency- Euro, Chancellor- Angela Merkel. i. Britain’s Prince Charles will succeed his mother Queen Elizabeth II as the Head of the Commonwealth after the heads of government agreed on his succession. ii. The Commonwealth leaders have reached an agreement on the succession of the 69-year-old heir to the British throne at a closed-door Commonwealth Heads of Government Meeting retreat in Windsor Castle. · The United Kingdom Capital- London, Currency- British pound, Prime Minister- Theresa May. i. External Affairs Minister Sushma Swaraj left for China on a four-day visit. She will participate in a meeting of the foreign ministers of the Shanghai Cooperation Organisation (SCO). ii. She will hold talks with her Chinese counterpart Wang Yi. This will be Ms Swaraj’s first meeting with Wang after he was elevated to be the state councillor. The visit is aimed at elevating the China-India strategic cooperation partnership. i. The Commonwealth countries have unanimously agreed to take action on cybersecurity by 2020. In a landmark declaration at the end of Commonwealth Heads of Government Meeting (CHOGM) in London, the leaders of 53 countries agreed to work closely to evaluate and strengthen their cybersecurity frameworks and response mechanisms. ii. A release issued, termed the declaration as the world's largest and most geographically diverse inter-governmental commitment on cybersecurity cooperation. · The Secretary-General of Commonwealth is Patricia Scotland. i. The 16th Federation Cup Junior National athletics championship has begun in Coimbatore, Tamil Nadu. Over 800 athletes from 32 states across the country will take part in this tournament. ii. The meet will serve as the selections trials for the 18th Asian Junior Athletic Meet to be held at Gifu, Japan, in June. · Tamil Nadu CM- Edappadi K. Palaniswami, Governor- Banwari Lal Purohit. · Tamil Nadu is the 2nd largest state economy in the country. · Gulf of Mannar Marine National Park is located in Tamil Nadu. i. Indian animation pioneer and multiple National Award winner Bhimsain Khurana had passed away. He was 82. Khurana was known for films like “Gharaonda” and for iconic animation shorts like “Ek Anek Ekta”. ii. His unforgettable work includes “Ek chidiya, anek chidiya” song. In 1970, he made his debut with his first animation short “The Climb”, which earned him the Silver Hugo Award in the Chicago Film Festival.